The S700 and S700 Pro both compete in the low-end SATA SSD market segment. The S700 Pro's closest relatives in the market are drives like the ADATA Ultimate SU800 that use the same 3D TLC and Silicon Motion's SM2258 controller. The S700 instead uses the Silicon Motion SM2258XT DRAMless controller, and is the first retail DRAMless SSD we've tested in quite a while. Earlier this year we previewed Maxiotek's MK8115 DRAMless SSD controller with both 3D MLC and 3D TLC, and the latter configuration has since come to market as ADATA's Ultimate SU700. Externally, the HP S700 and S700 Pro share the same minimalist case design with white labeling on matte black aluminum. Internally, the color scheme continues with black PCBs, and the differences between the S700 and the Pro become clear. The S700's PCB is half the size of the S700 Pro's PCB, due to the latter's use of external DRAM, the larger controller package necessary to accommodate the DRAM interface, and the presence of twice as many pads for NAND packages to make the 1TB S700 Pro possible. The controllers are branded with the HP logo, but the printing on the PCBs gives away the Silicon Motion models inside. Neither circuit board has space allocated for power loss protection capacitors, indicating that HP doesn't plan to re-use these designs for any enterprise products. Thermal pads are included on top of the controllers and on the back side of the PCB near the controllers, but there are no pads on the NAND or DRAM. The 120GB S700 and the 128GB S700 Pro are each equipped with three NAND packages containing a single 384Gb (48GB) Micron 32-layer 3D TLC die. The larger capacities of the S700 Pro use a mix of single-die packages and dual-die packages (two of each on the 256GB, and four of each on the 512GB). The higher capacities of the S700 instead use non-standard triple die packages that—combined with the lack of external DRAM—allows for a much smaller PCB. Since the SM2258 controller and its DRAMless SM2258XT sibling have a four-channel NAND flash interface, both the S700 120GB and the S700 Pro 128GB are operating with only three out of four channels active. The larger models can use all four channels but don't have the same amount of flash on each each of the four channels. These unbalanced configurations are a result of the drives trying to offer traditional capacities while using a TLC die whose capacity is not a power of two. Intel and Micron have addressed this awkwardness with their second generation of 3D NAND by designing it with TLC in mind as the primary use case, leading them to manufacture 256Gb and 512Gb TLC dies. Interestingly, the dual-die packages on our 256GB S700 Pro sample carry a higher speed rating than the dual-die packages on our 512GB S700 Pro sample, but this is unlikely to affect performance since the single-die packages on both carry a lower speed rating than either type of dual-die package. Likewise, the DRAM parts are different across the S700 Pro lineup: our 128GB and 256GB samples are both equipped with 256MB of DDR3-1866 rated for 1.5V operation, while the 512GB sample has 512MB of DDR3-1600 rated for 1.35V. These discrepancies probably reflect the supply constraints in the NAND and DRAM markets and these minor details may change over the course of the SSDs' production run. The S700 has the same amount of flash memory as the S700 Pro but offers lower usable capacities. This extra overprovisioning can help mitigate some of the performance penalties of using a DRAMless controller, but the bigger benefit is probably that it helps keep the write endurance ratings up in spite of the higher write amplification factor that DRAMless drives are typically vulnerable to. The primary points of comparison for this review are other SATA SSDs using 3D NAND. The HP S700 is at a disadvantage as the only DRAMless TLC product in our collection. Not having a DRAM cache for the NAND mapping tables is usually a serious handicap for SATA SSDs, and the impact is only worse for TLC SSDs where the controller also has to manage an SLC write cache. Many of the major SSD brands in the North American market don't have any DRAMless models, or have only used DRAMless controllers with MLC NAND. 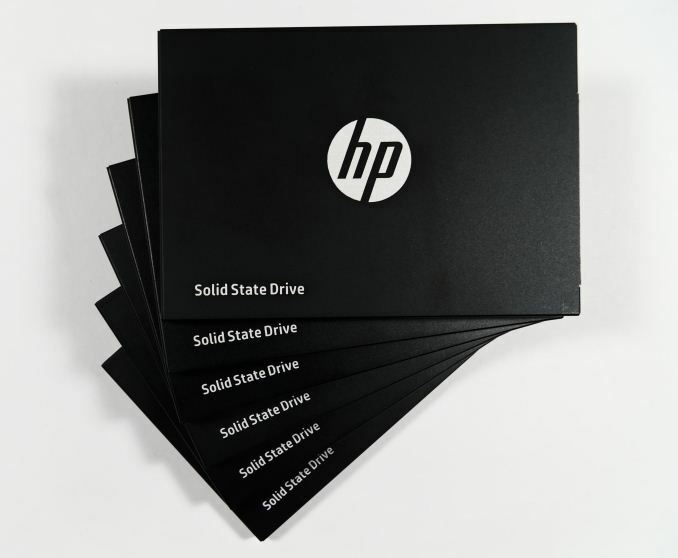 The HP S700 Pro is more on par with the entry-level SATA SSDs from most brands. The combination of the SM2258 controller and Micron 3D NAND has been extremely popular this year, and has replaced the combination of a Phison controller and Toshiba planar TLC as the most commonly chosen turnkey solution for brands seeking to sell SSDs with a minimum of in-house engineering effort. The few vendors that do use DRAMless controllers in their entry-level SSDs are usually much less interested in sampling those products than their higher-performance drives, and hardly anyone wants to sample the lowest capacities that offer the lowest performance. Many brands have ceased offering capacities below 240GB on newer models to avoid the performance limitations of using a small number modern high-capacity NAND parts in a low-capacity drive, though the NAND shortage that has been driving prices up all year has led a few brands to re-introduce 120GB models. We were generously sampled the full range of capacities for both the S700 and S700 Pro, save for the 1TB Pro model that hit the market later than the rest. Why is it "Pro"? Performance - nope, endurance - nope, warranty - nope, sounds better - nailed it. You sound spiteful. Are you hurt because Lenovo took over as the world's top ranking PC manufacturer after Q2 2013? HP has only gone downhill after that because all HP products have been made in China since who knows when. You can't have your cake and eat it too. The reality is that western labor costs about 10 times as much as Chinese labor, and it's a price competitive market. If an HP laptop was built domestically, it would cost hundreds of dollars more, and most people would buy the cheaper one built in China.